Abraham Badu-Tawiah obtained his B.Sc. (2002) and M.Sc. (2005) degrees from Kwame Nkrumah University of Science and Technology, Kumasi – Ghana, and M.S. (2007) degree in Chemistry from Indiana University of Pennsylvania, Indiana PA. 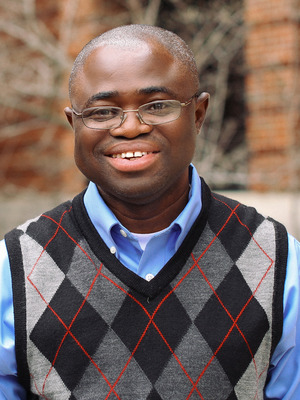 He received Ph.D. (2012) in Chemistry from Purdue University (under the supervision of R. Graham Cooks), where he was awarded Andrews (2007 – 2009), Bisland Dissertation (2011), and Lilly Innovative (2012) Fellowships. From 2012 to 2014, he was a postdoctoral fellow at Harvard University under the direction of George M. Whitesides. He joined The Ohio State University, Department of Chemistry and Biochemistry in July 2014. The Badu Research Group currently has three main research foci: (i) diagnostic mass spectrometry (MS) - in this project we focus on the development of new MS tools for non-experts (e.g., surgeon, immunologist, neuroscientist, etc. ), and to make MS data acquisition and interpretation easier for them. We are developing new chemical probes that enable mass spectrometric analysis of proteins, antibodies, DNA, and other disease biomarkers under ambient conditions. (ii) Accelerated droplet reactions - here, we focus on the development of new tools to study organic/bio-molecular reactions using droplets as reaction vessels. We are interested in green catalysis, new reaction pathways, and the mechanism governing reactions in the micro-droplet environment. (iii) Aerosol therapy - in which we use MS as a tool to characterize drug aerosols, and to improve on their efficacy. All students that study in the Badu research group become exposed to the fundamentals of ambient ion chemistry (in a droplet or at an interface), modern MS instrumentation, bio-molecule handling, and bio-assay/immunoassay development. We are currently interested in accepting new students. Simplified diagram of accelerated droplet reactions.